But in the fall of 1992, as the presidential battle between Bill Clinton and George H. W. Bush raged onward, Gilbert concerned himself with the Republican National Convention. 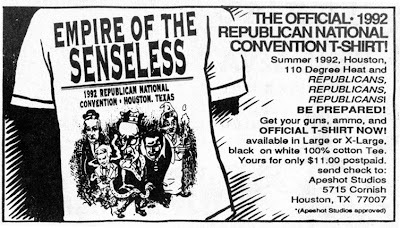 In so doing, he created the "Empire of the Senseless" t-shirt, named for a song by The Mekons (which appeared on their 1989 album, The Mekons' Rock'n'roll, and which mentions, of all people, Oliver North by name in its lyrics). I sold a fair number of the Empire shirts, screening them in my house with a very primitive screen set-up. I sold them via ads in the Public News (the ads being a trade-off for the paltry sum the PN paid me for my weekly "True Artist Tales" strip). I recall delivering one set of shirts to some downtown high-rise corporate office bike-messenger style, which was fun. In the art on the Empire t-shirt, we have a number of the candidates running for office at the convention. Left to right: James Baker as Chaplin's globe-trotting 'Little Tramp", little Danny Quayle hitting on a bong, King George himself preening out front, Pat Buchanan as Dracula, and David Duke as a clown-faced Klansman. My acquaintances and I did what we could to oppose the Bush-1 regime at the time. One memorable event I organized was a protest march on the book-signing appearance of Oliver North. We marched down Alabama from the PN headquarters at Dunleavy (at the time) to the Bookstop on Shepherd, all wearing xeroxed Oliver North masks, carrying a boombox blasting Public Enemy and other righteous songs. During the convention, I also did a huge mural on the front window of the Lawndale Alternative Gallery on Main, which was a reproduction-blow up of a one of my "True Artist" strips condemning the actions of winner-take-all capitalism in which the Bush machine was engaging. You do what you can, and at that time I had the energy to do a few things. In 1996, Gilbert moved "True Artist Tales" to another weekly publication, the Houston Press. (Public News folded in the late 1990s). He retired the comic about five years ago and is now a librarian at a Houston college. "[I'm] not doing much art or comics," he writes, "but I still enjoy the old stuff." As for the name, "Empire of the Senseless," it was used as the title of a 1988 novel by experimental writer Kathy Acker, four years before Gilbert would use it for his t-shirts and a year before the Mekons released their song of the same name. In 1993, it became the title of the second album by the British band, the Senseless Things. In 2004, a Milwaukee blogger (and apparent Vonnegut fan) calling himself "Billy Pilgrim" appropriated it for his site. 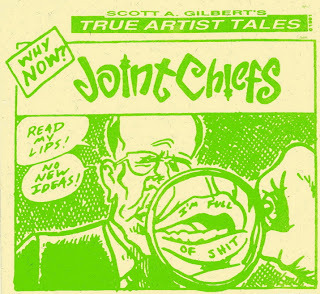 For good measure, you can find an archive of Gilbert's "True Artist Tales" here (although the online archive includes only those strips from 1998 to present). When the Mekons played [in Houston] at Emo's in 1993, I gave them an "Empire" shirt, which they much appreciated and showed off at the beginning of their set. It was a lovely turn of the ironic cycle. Scott's the man; it's a shame to hear he's no longer doing much art these days. While doing the PN strips, by the way, he also self-published a book as "Apeshot Studios Press," entitled It’s All True! : The Best of True Artist Tales. If you ever run across a copy (I got mine directly from Scott, so I'm not sure where/how he sold 'em), I'd grab it, 'cause it's well worth checking out. Hmm, I wonder if Acker was making a play on the title of Oshima's legendary film Ai no Corrida (1976)? Although commonly known in English speaking countries as In the Realm of the Senses, the film is known in French as L'Empire des sens and occasionally referred to as Empire of the Senses. Hey, you old Space City Rocker! I have LOTS of copies of the book, It's All True: The Best of True Artist Tales left for $4 postage paid. Email me if you're interested, and I do take Paypal. One day, will you say it?